With Mr T’s 40th birthday and our second wedding anniversary in the last week, something special was called for. We studied the menus of a few of Sydney’s top restaurants and chose Guillaume at Bennelong, Mr T’s reasoning being that the degustation features two desserts. Not only that, they involve both dark chocolate and raspberries! In summary, the whole experience is exquisite: a masterclass in simplicity, refinement and balance, from the service to every morsel set before us. The only thing not understated is the magnificent setting inside the ribcage of the smallest Opera House shell with views of the city skyline and Harbour Bridge, which we are lucky enough to enjoy from the best table in the house at the ‘prow of the ship’. It pays to let them know beforehand if you’re celebrating a big occasion. Are you sitting comfortably? Then I’ll begin! First the ‘amuse bouche’ which is a chilled, creamy oyster served in its shell, set in a soft, green jelly tasting of cucumber and briny oyster juices. 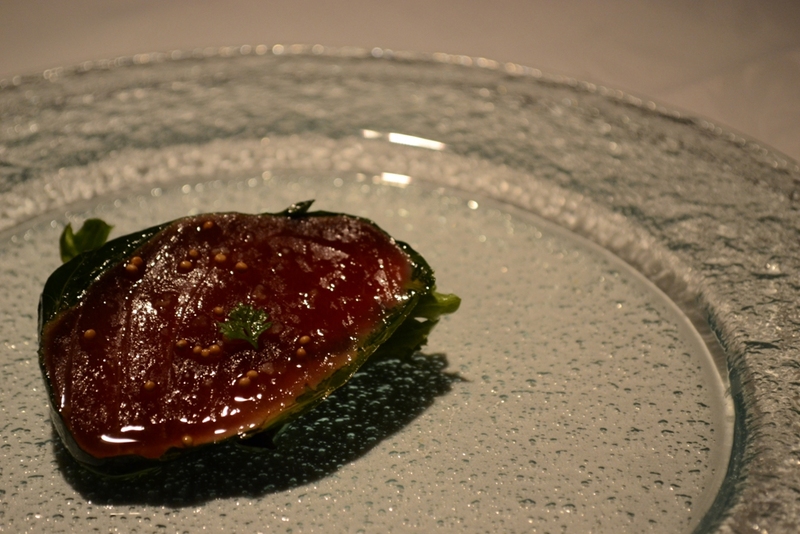 The first course is a piece of raw sashimi -grade yellowfin tuna, wrapped in basil leaves and very subtly dressed with soy and mustard seed vinaigrette. It’s all about showcasing the clean, mildly rich flavour of the tuna. 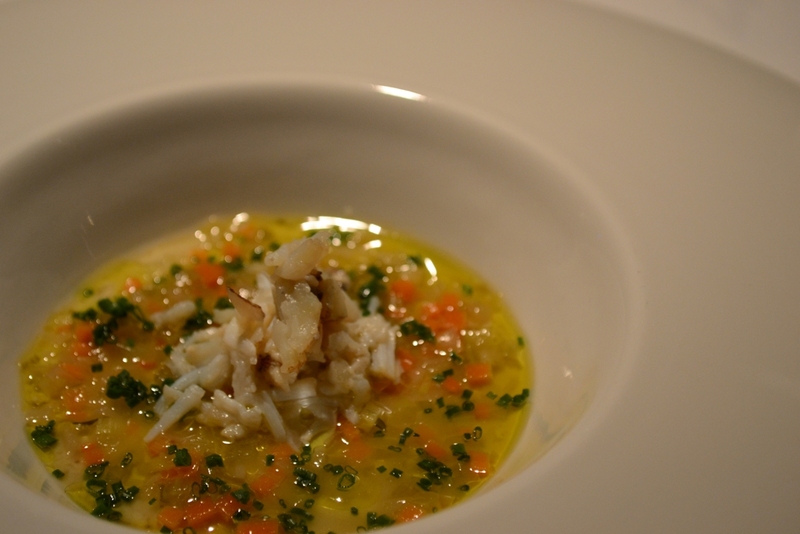 Next is a royale of globe artichoke, a light-as-air artichoke mousse which hovers above your tongue, beautifully complemented in its creaminess by a small pile of mud crab, both of which are cut through by the acidity of a barigoule vinaigrette floating on top with the crunchy texture of very finely diced carrots, celery and chives. After that comes scallops, pan-fried with a golden crust, sitting on a watercress sauce and lemon foam (in which the flavours of watercress and lemon are strangely illusive). Perched above is the finest potato crisp with the texture of wafer, topped with little bubbles of salty caviar that pop in the mouth, and for a little drama there are dark purple edible petals. 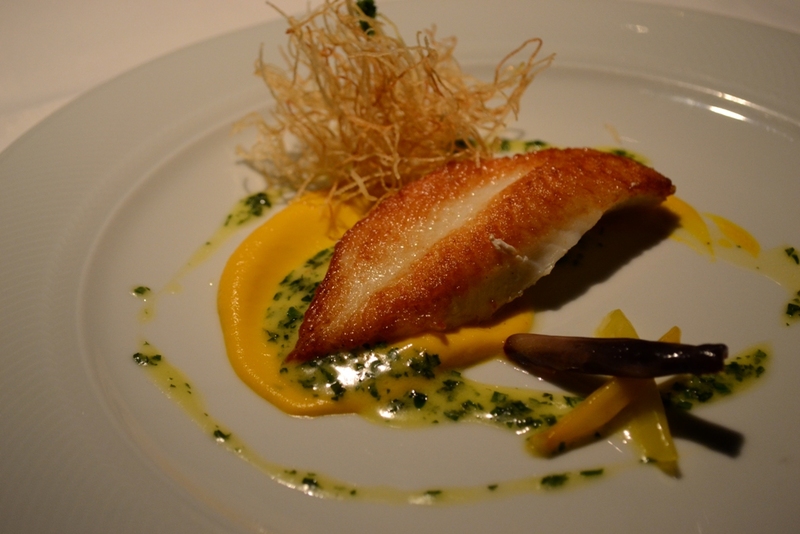 This is followed by a fillet of John Dory, again beautifully crispy on the outside, surrounded by a puddle of carrot and ginger purée with coriander, accompanied by a delightful tumbleweed of crispy, angel-hair potato allumettes (matchsticks). Talk about fancy fish and chips! The flavour of the purée is fantastic and instantly makes me feel like making soup, and there are beautiful sweet, buttered heirloom carrots too. 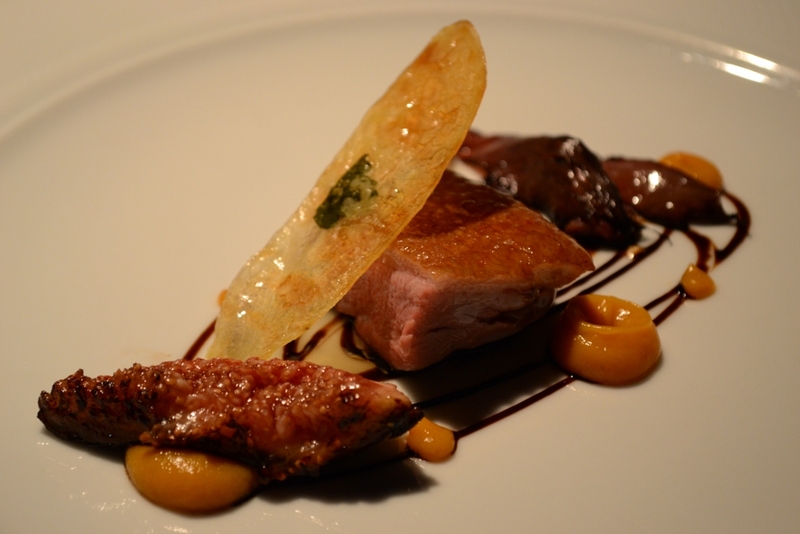 Next up is a cube of Grimaud duck, rich, fatty and dark pink, served with little mounds of divine sweet potato and foie gras purée and a wedge of fresh fig, rounded out by the bitter, slightly burnt flavour of char-grilled radicchio and fine swirls of balsamic jus. 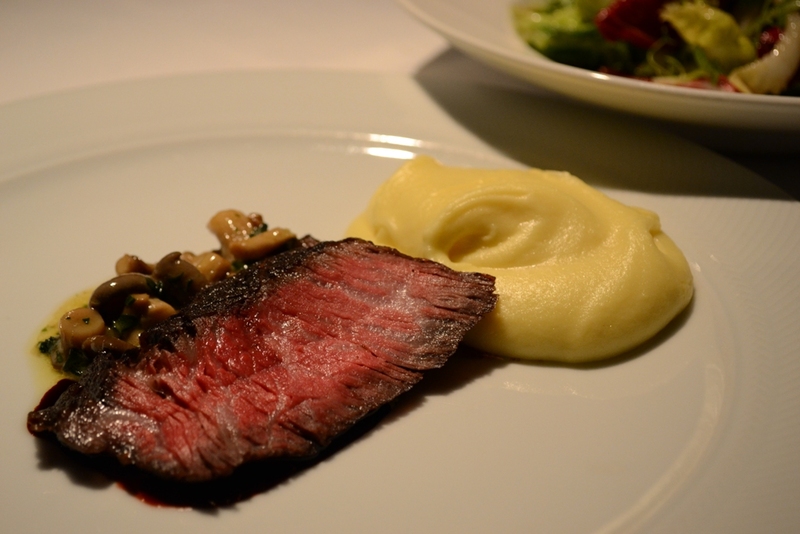 The final savoury course is deboned rib of Tajima Wagyu, tender, very rare and streaked with fat, accompanied by tiny, herby mushrooms and a generous couple of spoonfuls of Paris Mash which is velvety and sticky and melt-in-the-mouth buttery. Seeping out from underneath the beef is a pool of thick Merlot reduction (20 bottles of wine to one or two litres of sauce! ), a viscous, blackcurranty syrup of heady deliciousness. It’s Mr T’s lucky night because instead of two desserts we actually get three, on account, I think, of his birthday. 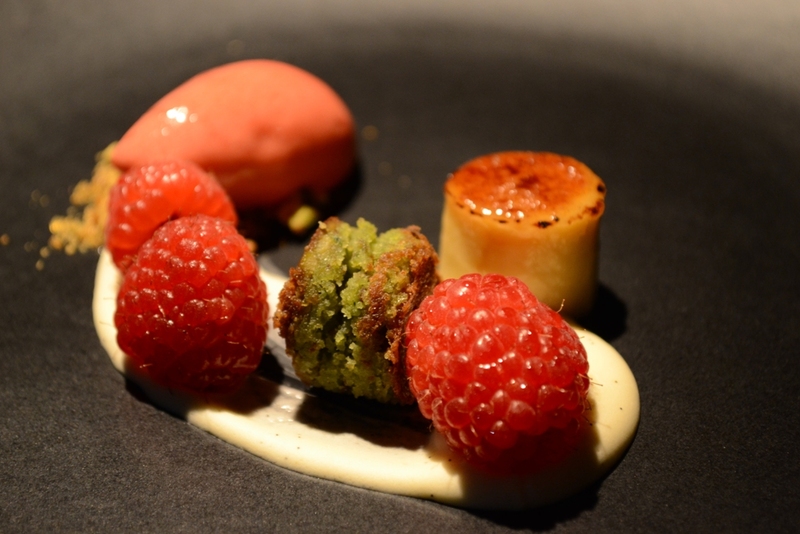 The first is fresh, plump raspberries on a smear of vanilla cream with a little almondy pistachio cake, a perfect miniature crème brûlee and a quinelle of raspberry sorbet which tastes exactly of fresh raspberries. 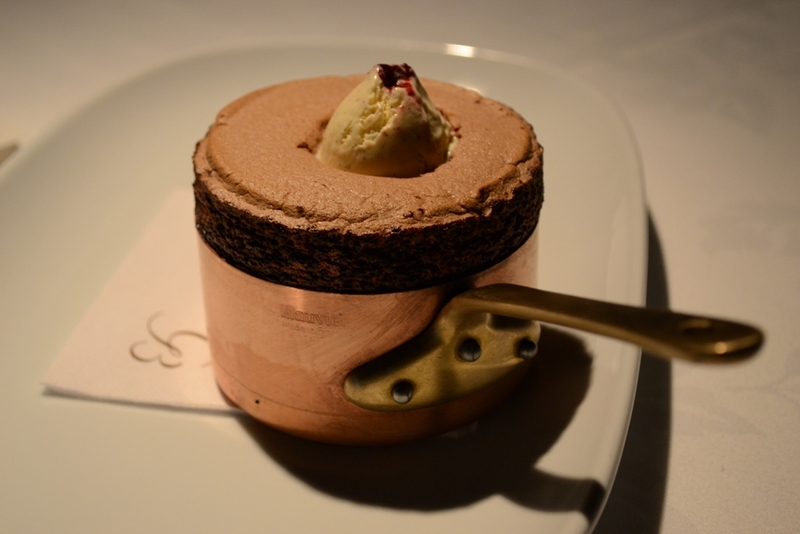 Next is a Valrhona dark chocolate soufflé served in a tiny copper saucepan with a scoop of vanilla bean and cherry ripple ice cream inserted, at the table, into the top. Mr T’s verdict is that it’s not chocolatey enough but I thoroughly enjoy its feather-light consistency with slightly chewy bits round the edges, although I don’t detect any cherry flavour in the ice cream. 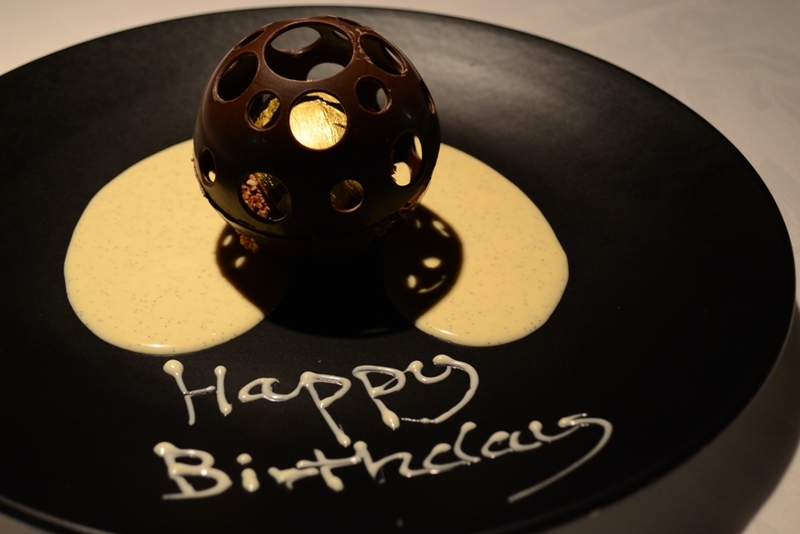 Our bonus dessert is the Valrhona ‘Guanaja’ globe: dark chocolate ice cream rolled in caramelised chopped hazelnuts and topped with gold leaf, sitting inside a hollow chocolate globe with Swiss-cheese holes, on an expanse of vanilla bean crème anglaise that spells out the words ‘Happy Birthday’. Mr T finds this dish “intensely chocolatey” which in his world is a very good thing! I go for the matching wines as it’s such a fabulous opportunity to try some drops that I’d never normally have the imagination (or the budget!) to sample, given my propensity to stick to what I know and love. They’re all delicious and I’ll certainly be looking out for some of them at the local bottlo. Although we have a truly wonderful night, we’re not sure if it’s worth the $500 plus that it costs. But then you don’t go to a place like this for value for money; you go for the experience which, as I said at the beginning, is exquisite. And if you can’t do it to mark a 40th birthday, then when the bloody hell can you?! 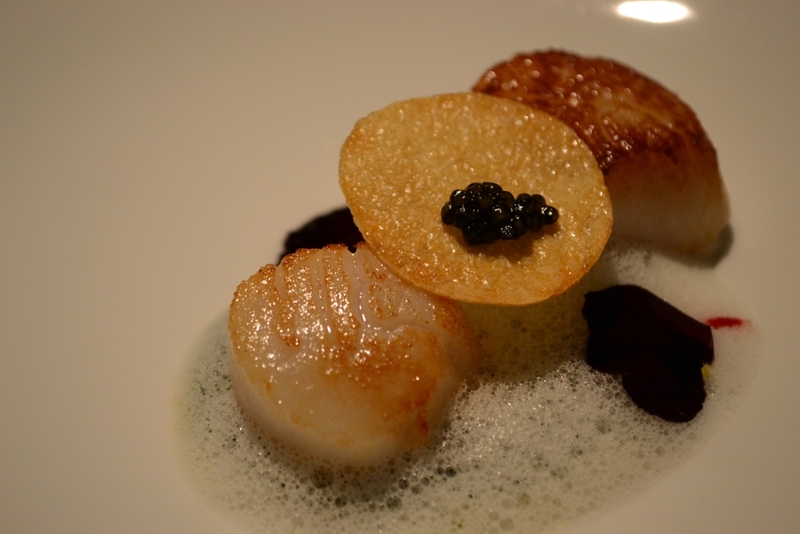 This entry was posted in Bennelong Point, Degustation, French, Guillaume at Bennelong, Restaurants by oystersandoxtail. Bookmark the permalink.